Recognized as one of Maryland’s Top 100 Women in 2008 , Juliette Rizzo is the Director of Exhibits and Agency-wide Outreach for the U.S. Department of Education in Washington, D.C., overseeing the development, implementation and management of a national program that puts a human face on the Department and reaches across America to the general public and education communities nationwide to explain education policy and promote opportunities for millions of students. In this capacity, she reaches across the nation advancing the Department’s strategic external outreach priorities to key stakeholders, while also coordinating internal agency-wide outreach across all principal offices and regions. As part of an executive leadership program, Juliette just completed working with the National Transportation Safety Board in D.C., where she advised on internal and external communication strategies for the agency and its modal offices under the direction of the managing director. Prior to this, Juliette served as a special assistant for communications in the Department of Education’s Office of Internal Communications, which was located in the Office of the Secretary. Known as an articulate and energetic advocate, leader, and mentor, Juliette has made a lifelong commitment to educating the public and bringing visibility through the media to cross-disability issues that impact the disability community. She began her career at the Department as the Director of Communications and Media Support Services for the Office of Special Education and Rehabilitative Services (OSERS), working in the office of the Assistant Secretary. Juliette also provided communications support to the Commissioner of the Rehabilitation Services Administration and the directors of the Office of Special Education Programs and the National Institute on Disability and Rehabilitation Research. In addition to media relations, Juliette directed both internal and external communications, as well as national events, including milestone celebrations for the Americans with Disabilities Act and the Individuals with Disabilities Education Act (IDEA). Before coming to D.C., Juliette was recruited by Pierce, Deditius & Galyean (PD&G) Advertising, the once leading healthcare advertising agency in the Southwest, to direct public relations for the agency’s national and international client base, including Johnson & Johnson Medical, Columbia Children's Hospitals and Sulzer Orthopedics. Her work was recognized with a “Best of Texas” award from the Texas Public Relations Association and an International RX Award. Prior to this, she served as Director of Disability Support Services for Texas Woman’s University, managing a caseload of over 200 students with disabilities and expanding academic service provision and curriculum access across the University’s four campuses. In between advising and mentoring students, consulting with staff about reasonable accommodations, and chairing the University ADA committee, Juliette increased visibility of available services through an expanded community outreach program and an award-winning promotional campaign. Juliette holds a Master of Journalism degree, focusing on public relations with a unique minor in rehabilitation studies, from the University of North Texas and a Bachelor of Science degree in journalism from Texas A&M University. Juliette also is a graduate of Partners in Policymaking, a national leadership training program to promote independent living and to teach self-advocates with disabilities to influence public policy. Residing in Bethesda, MD, she is currently serving her second governor-appointed term on the Maryland Commission on Disabilities and was recently appointed to the Maryland Statewide Independent Living Council. Just a few months ago, she was honored as Advocate of the Year, along with Congressman Elijah Cummings, by the League of People with Disabilities. In 2007, she was honored by Washington Women in Public Relations (WWPR) as one of three extraordinary public relations practitioners in Washington, D.C., and she was just selected as the National Association of Government Communicators (NAGC) Communicator of the Month. Juliette also applies her award-winning public relations background to raise awareness of arthritis and its impact on 46 million Americans, serving in a volunteer capacity as National Public Relations Chair for the Arthritis Walk, an $11 million property involving nearly 350 events in 40 markets with more than 80,000 walkers. She is recognized by Tau Kappa Alpha National Honor Society in Journalism, is a member of the Federal Communicator’s Network, the NAGC, WWPR, the Texas A&M University Former Women Students’ Network and is appointed to the boards of Easter Seals Greater Washington Baltimore Region, the Universal Center for Development and Access Information Inc.
A nationally known keynote speaker, spokesperson and event hostess, Juliette is listed with Damon Brooks Associates, the leading nationwide speakers bureau representing people with disabilities, and appears regularly before audiences from 10 people to 20,000, across the United States speaking on topics ranging from the employment of people with disabilities to accessible transportation, image building, diversity and health and wellness. Recently asked to serve on the Interagency Workgroup on the Employment of People with Disabilities in the Federal Workforce and to chair its sub-committee on education and marketing, Juliette also delivers keynote addresses and diversity workshops across the federal government focusing on the employment of people with disabilities. Previous addresses have included the Office of Management and Budget in the Executive Office of the President, the Departments of Treasury, Defense, Homeland Security, Commerce, Energy and Education, as well as the Social Security Administration, General Services Administration and NASA. Recognized for her numerous achievements, Juliette was selected as Ms. 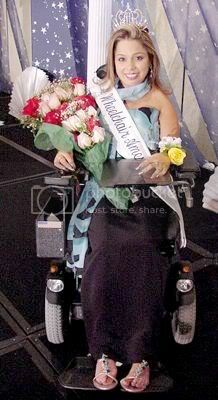 Wheelchair America 2005, and was featured in publications and on radio and television around the world, including Woman’s World Magazine, The Today Show (with Al Roker), NPR, the Maurice Boland Show (Spain), Arthritis Today, Exceptional Parent, Vegetarian Times, New Mobility and The Washington Post Magazine. Refusing to accept the barriers many women with disabilities face to receiving adequate healthcare, Juliette advocated to the U.S. Department of Health and Human Services (HHS) Office on Women’s Health to ensure the needs of women with disabilities are integrated into nationwide women’s health information dissemination and national awareness campaigns. As a result, Juliette was selected by HHS to appear on the CBS Early Show as the first woman with a disability to serve as the national spokeswoman for National Women’s Health Week and National Women’s Check-Up Day, advocating to millions for preventative health screenings for all women and breaking down firsthand the myth that disability equates to sickness. As a freelance journalist, Juliette also has been published in Allied Healthweek, Nurseweek and Advance magazines. I think it is very useful and information able details about website on mobilewomen.org.Now a days it is a remarkable site for all the people.This site help us many way.I always love this site.I would like to thank you for the initiatives you have created content. You can adhere to me by my best Personal trainer sacramento, Weight Loss Programs, Knowing the best workout routines, Healthy Meals and Guides, keep your health and fitness levels high with Ken Karnacks 25 years of expert advice and help. Just the right motivation for women to keep themselves in track of living a healthy lifestyle. I'll sure be checking up updates in your page, you just gained another subscriber, I love the blog!